When it comes to toys, I avoid shopping in retail stores as much as I can and have found that making purchases online has multiple benefits. First, the fact that I can do it in my pajamas at any time of day and not have to deal with having two kids pulling things off of the shelves is a major bonus. Second, the internet has the ability to introduce me to so many great companies and products that I otherwise wouldn't have come across in my traditional retail store. 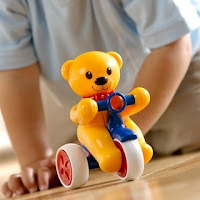 Recently I was introduced to one such company and its variety of great brands when I discovered the high quality, imaginative, unique toys, gifts and collectibles available at Reeves Toys. On a mission to provide children with incredible items that encourage wholesome and imaginative play while nurturing an appreciation for education, animals and the environment, Reeves International makes and distributes only the brands that they deem as exceptional in meeting these standards. Plus, having been in business for more than 60 years, Reeves has a strict policy that every one of their unique toys for kids pass and exceed all safety standards, whether Federal, State or just within the industry. When you make a purchase from any of the great brands at Reeves International, whether a sand and water toy from AquaPlay, a beautiful Treasure Box at Enchantmints or a bath toy from Tolo, you can rest assured that it will provide hours of safe fun for your child. As Big Sister E and Little Sister B have been into magnetic toys recently, I decided to see how much fun we could have with the Wheels Fantasy Race Set from Geomag. 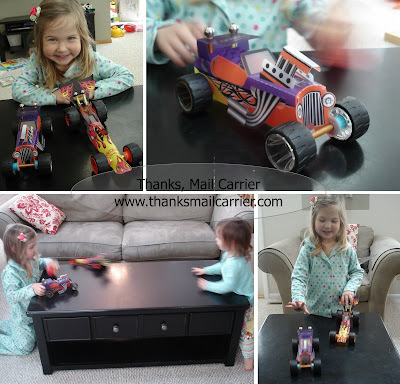 Designed for ages 4 and up, I knew that Big Sister E would be on the young end of the spectrum for assembling and constructing these free-wheeling vehicles, but assumed that she would still really enjoy playing and racing them. So, first thing in the morning, we pulled this kit out to check out just how much fun these magnetic toys for kids could be. What we found waiting inside the box were three flexible car "bodies," six small tires, two large tires, eight spokes to attach the wheels, eight magnetic rods and 16 non-magnetic steel balls. And, unfortunately, no directions. As someone who somewhat obsessively follows step-by-step when building or constructing something, I checked both the inside and outside of the box multiple times before realizing that the images on the back were all that I was going to get. Fortunately, it didn't take me too long to catch on to how to slide the rods through the holes, pop on a wheel and secure the whole thing with a steel ball. Big Sister E kept herself happily occupied creating letters out of the pieces while Little Sister B had a good time rolling the smooth balls around on the table (I was fully aware that Geomag doesn't fit into the category of age-appropriate toys for Little Sister B, but I kept a close eye on her and she never once attempted to put any of the pieces in her mouth). After a small amount of trial-and-error attempts on my part, I began to see how easy it was to construct with the Geomag parts and pieces. The spheres themselves weren't magnetic but the strength of the rods was plenty strong enough to reach and hold either the frame or the wheels right in place. I initially thought that there was no way that my completed automobiles were going to hold together well enough to actually be pushed, pulled and raced, but was pleasantly surprised to find that they did just that. In fact, even when both girls were grabbing them and pushing them back and forth to each other (and often missed, sending the cars diving off of the table), nothing happened besides a ball popping off once or twice. Even though both kids were a little too young to fully enjoy creating race cars, they did have a good time with the interactive, open-ended possibilities of the Geomag rods and spheres - not to mention the completed projects that I built for them. 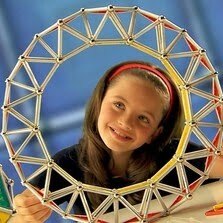 For older kids, I think constructing and playing with these cars would be a lot of fun. Plus, with various other types and sizes of Geomag kits available, they could be combined for an even bigger, more entertaining experience! 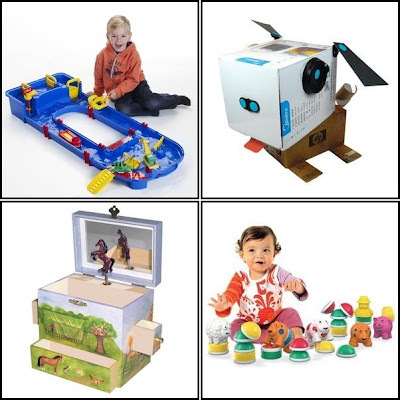 One lucky person will win the toy, collectible or gift item of their choice (up to $30) from Reeves International! To enter to win: Visit Reeves International and tell me which item(s) are your favorite. 3 Extra Entries if you blog about this giveaway linking back to Thanks, Mail Carrier and Reeves International. Please leave an address where it can be found. Giveaway will end on November 19th at 11:59pm CST. Do me the favor of leaving an email address or making absolutely sure it is visible in your profile, I have to have a way to contact the winner. The winner will be chosen by random.org and announced here as well as emailed and will have 48 hours to contact me or respond to notification or a new winner will be chosen. This giveaway is open to U.S. residents only. 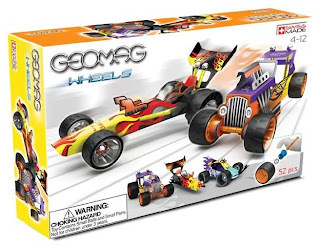 A big thank you to Reeves International for providing a Wheels Fantasy Race Set - 52 pcs for me to review as well as the item of choice for one lucky giveaway winner. The opinions shared are my own and honest if you really need to see more, click here to see how I roll. Geomag my house for my nephew. I like the Push & Go Teddy and the Big Dig. I entered the Cheryl's Cookies giveaway. I entered the SanLori Holiday Cards giveaway. I like the Green Wheels Race Set. Thats what I would choose. I like the COmplete Noah's Ark Set. I entered the Hair Coverings giveaway. I would love the Ballerina Music box for my daughter! I like the Makedo find & make dollhouse (57 pcs). Signed up for news and updates from Reeves International. I like the Kids Color - 110 pcs. I like the Baby Police Car. I "liked" Reeves on FB. I left the message on their FB wall! The first friends go cart is too cute! My son would love that! I like G Baby Sea 11 pieces! Too cute! I like the Aquaplay n go set!